Alec Rauhauser passes across the blueline 10/21/17 against Minnesota State. 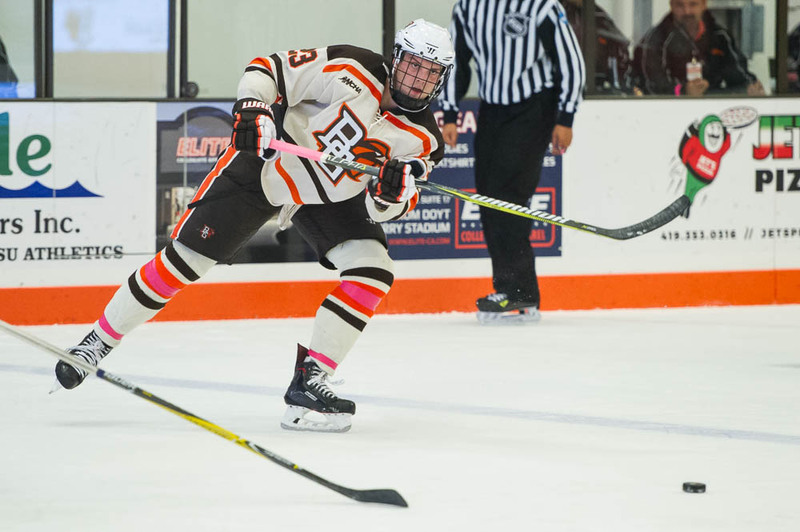 Rauhauser leads the team with six assists this season (Photo by Todd Pavlack/BGSUHockey.com). The Falcons again took a 2-1 lead to the third period, but the Huskies were able to find the tying goal Saturday. Michigan Tech opened the scoring in the first period at 13:43 with a Keegan Ford power play wrist shot. The Falcons responded at 19:43 of the opening period with a power play of their own when Cam Wright deflected a Stephen Baylis shot for his fourth goal of the season. Mitch McLain scored the Falcons’ second goal at 12:13 of the middle period with a power play rebound marker, but Mitch Reinke’s goal at 14:56 of the third period tied the game at 2-2. 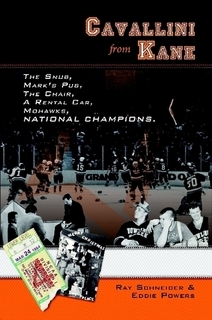 The game would eventually go through two overtime periods before Stephen Baylis’ wrist shot in the sixth round of the shootout, and subsequent save by Ryan Bednard on a Justin Misiak shot, gave the Falcons a shootout win. The game is officially recognized as a 2-2 tie for NCAA/Pairwise considerations. With the Falcons earning five-of-six WCHA points on the weekend they find themselves in a tie with Minnesota State for first place in the WCHA. It’s the first time the Falcons have been the top-placed team in the WCHA since the 2014-2015 season. Bowling Green is on a five game unbeaten streak (3-0-2). Each of the Falcons’ goals this weekend came on the power play. Bowling Green was 2-for-7 on Saturday and 4-for-11 on the weekend. Bowling Green’s overall mark this season is 10-of-46 (22%). They were 4-of-5 on the penalty kill Saturday and 10-of-12 on the weekend. Their season mark sits at 43-of-51 (84%). The Falcons’ top-four players in points are freshmen or sophomores: Cam Wright (4-5-9), Alec Rauhauser (1-6-7), Max Johnson (1-5-6), and Brandon Kruse (1-4-5). In the lone nonconference game Saturday Alabama-Huntsville beat Arizona State, 3-1. In league games Alaska-Anchorage won their first league game of the season with a 4-1 decision over Lake Superior, Northern Michigan earned a weekend split with a 4-1 win over #9 Minnesota State, and Bemidji State also earned a split with a 3-2 win over Alaska. The Falcons travel home to welcome the Lake Superior Lakers (2-6-2, 1-2-1-0) to the Slater Family Ice Arena this Friday (7:37et) and Saturday (7:07et). Friday is Military Appreciation Night.